In some of the threads about Sandbox campaign devolve into shouting match over whether it is was the default style "back in the day". The short answer of course not. RPGs are very flexible including the first version of Dungeons & Dragons. Very quickly RPGs campaigns grew in diversity once the game spread beyond it's minature wargaming and upper midwest roots. However there is a reason for the "Golden Age" aura that surrounds the use of the term Sandbox. Wargames have several ways they can be played. One is that you start with an order of battle, and a large scale map. 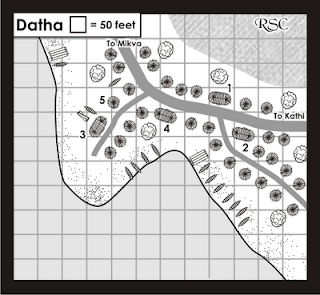 Both side maneuver and where opposing forces come into contact a battle is fought using a smaller scale map. This style of wargame is called the campaign. And it shares many of the characteristics of a sandbox both RPG wise and Video game wise. There is little constraints on the player's actions other than the limits of the map. And sessions solely devoted to resolving individual battles. Sounds familiar? More so than miniatures the campaign has proven to be the most enduring legacy of Roleplaying's wargaming roots. It is also the source of the confusion over sandbox campaigns in the earliest days of D&D. But the connection is over hyped as RPGs campaigns quickly grew in diversity compared to their wargaming counterpart. It appears that several of my pictures are not showing up well on various computers. Let me know which ones specifically and I will fix them. Note that Datha in Part XIV I believe is now fixed. I think the problem was that I was saving the jpegs using 32-bit CMYK and it there are issues with that on Apple Macs. While the gaming style is old the term Sandbox, applied to RPGs, is very new. Sporadically threads will appear about sandbox campaign on various forums. While some start worthwhile conversations many degenerate into rants with various antagonists intent on slagging each other. A recent thread on theRPGsite is more the former than the latter. My point of view on Sandbox Campaign is somewhat limited. I view it as a method of organizing your setting in a way that makes it easy for you to referee when players go off wandering on a tangent. It is a compact way of organizing local information about a region. Most threads on Sandbox campaign talk about the style of the campaign run using this format. Basically the big misconception is that referee is essentially a simulator running the NPCs and monster as the players wander from point to point. There is no plot adventure only happens when players run into a spot where it is located. Most folks write that when they try this the result are a bunch of unhappy players who are bored. Most of the time this because the referee is too passive and the player don't context in which to decide where to go. Player that are highly motivated can make this work and sometimes this results in a great campaign. However most of time it doesn't work so well. The Sandbox format can be used to create any type of campaign. You can even make a railroad out of it by having all your locales obviously point to a certain director or event. Some campaign go the realistic route and write up the locales as they were a slice of a living breathing world. Paizo's Kingmaker has many locales have clues about the ultimate menace of the adventure path. 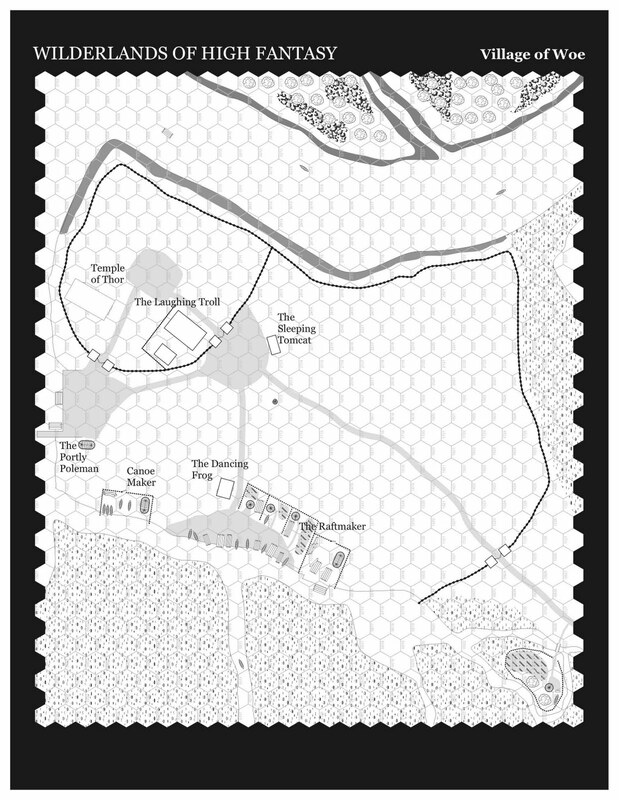 Other are a slice of life design to be exploited by the players as they build a kingdom in the Stolen Lands. And there are few randoms stuff thrown in to liven the mix. I use the Sandbox format to create a setting to immerse the characters in. My style is that character are part of a living world where their choices have consequences both good and bad. If they choose to do nothing then world will simply go about it's business indifferent (and sometimes hostile) to character's well being. But if they choose to be involved then they will make a difference and leave their mark on the setting. I developed this because I found players love when their decisions have meaning. The Sandbox format I use to describe the Majestic Wilderlands isn't enough. I need to add other techniques to make this work. First I work with each player individually to develop a background of about a page length. This give them the context in which to make their initial decision of where to go and what to do. Second I generally insist on folks speaking in first person and roleplay, however bad their acting is, the character. More than a few just play a fantasy version of themselves which is OK, the important point they are actively interacting rather then looking at their characters as figures to pushed around. Third is called "World in motion." I didn't make up the term. Lord Vreeg coined the term in response to a post of mine on theRPGSite. Basically a World in motion has events unfolding and NPCs living their lives outside of what the players are doing. You sprinkle news of what going throughout NPCs conversations or props like billboards or news items. Note that these events can be very local in scope. They don't have to be global. World in Motion is how a referee injects a plot into his sandbox campaign. Rather being a choice of adventures the "plot" unfolds around the character through the events of the campaign. It is up to the players to interact with these events and resolve them however they like. Fourth, culture and religion are important in my campaign. The conflict between different values both on a global and local scale provides many seeds for adventures. The background material that goes into this also give character additional stuff to use in interacting with the Majestic Wilderlands. Your sandbox campaign may mix in other techniques to create your own unique mix. What is important is to remember that is a tool that has certain strengths. I think it is an underdeveloped tool, long ignored until recently. But in the end it is just one of many choices you have to organize a campaign. Datha is a small fishing hamlet on East Bay. A hundred humans live here in mud and wattle huts along the shoreline. 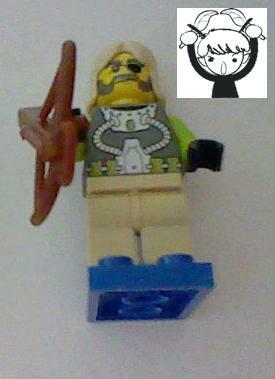 The headman of the hamlet is Danis Hobrun who is thoroughly loyal to Baron Argus. Danis’ brother, Helmar is the yeoman in chief of the Baron’s small coast guard. Helmar and his fellow yeoman patrol shores of Piall looking for smugglers. This is the home of Danis Hobrun the village headsmen. He supervises the planting of the village's 1,500 acres. He is also the Baron's baliff and is empowered to hear cases of low justice. He worried that his brother, Helmar, will get the village into a feud with the village of Carras. He longs to explore some of the ruins on the northern end of Piall Island and is willing to help supply in an adventuring party going north or a half or full share. He has 1,000 gp, two boats, 10 javelins he can use. Swordfish Tavern - this is the local watering hole. It is noted for it's locally brewed grog which has fermented fish oil as one of it's main ingredients. Roll vs poison or throw up the contents of your stomach for 1d6 round. Strung along the central beam is a 7 foot long stuff Swordfish. Antimus Boats - this establishment builds and repairs boats. Antimus Black can make up to 40 foot single mast coasters. He noted for carving elaborate decorations into the boat. This is the home of Helmar Hobroun and the headquarters of the Baron's Coasters the local coast guard. 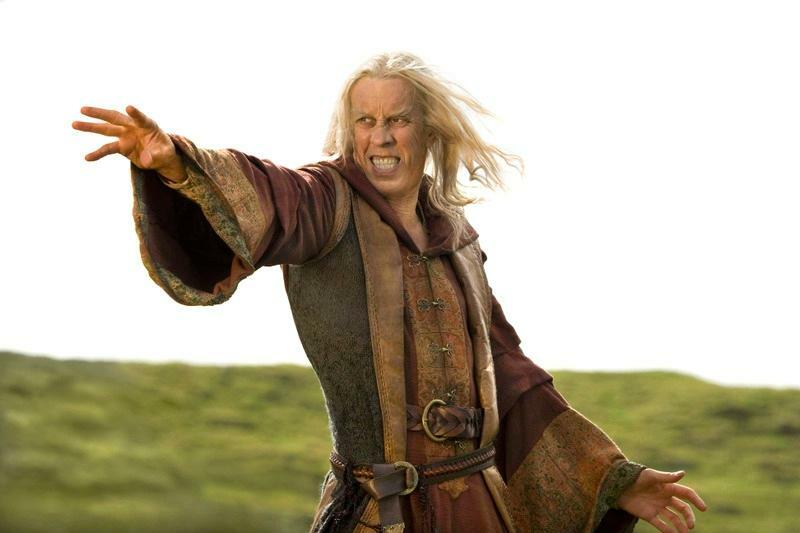 He hates Moran Lordar of the village of Carra and will do anything to bring him down and his pack of thieves. Typically a single boat will go on a week along patrol of from East Bay to Southpoint. The patrol at the end of the month will also circle the island. This village is typical of the type of settlement I make. Grimy, very medieval, and lots of intrigue even though is not earth shattering in scope. Players that get involved in these plots often wind up with valuable friends and allies. This village also showcases my hut and boat symbols. Because I kept at mapping for so long I managed to accumulate a variety of symbols that allow me to throw together maps quickly. They were originally developed for a map of the Village of Woe in the Wilderlands of High Fantasy. I never finished it but you can see it partly done. That it for part XIV next is Part XV. About once a month I been heading up to Gold Star Anime in Edinboro play some Swords & Wizardry plus the Majestic Wilderlands. Last month's games is found in Part 1 and Part 2. When we last left the players were organizing the defense of the villagers while harvesting. Two new players jointed us. Jay who played a 3rd level dwarven rune-caster and another Josh who played a elven burglar. In addition to new Josh and Jay there was old Josh who played a human thug, big Jerry who played an elven cleric of Silvanous, and his son little Jerry who played a halfling fighter. John who played the mage Alagazar from the last session couldn't make it this time. We all sat down and started to play. After a couple minutes we realized that that every player name started with J. Big Jerry and Jay were on my left, new Josh sat at the end of the table, Little Jerry and old Josh sat on my right. Josh "To my right" promptly named the group the J-Squad. Writing this post I realized that the last session was also a J-Squad as well. This is getting a bit weird. Next I suppose I will having playing a Jordan, Jane, Jennifer, Joshua, etc, etc. It started with new Josh, playing a elven burglar, and Jay a dwarven runecaster sitting down at the Greenhaven Inn in Denison's Crossing. The messenger from Kensla burst proclaiming that the village need help desperately. New Josh agreed to go after after being made aware that the Baron of Westtower would probably give a reward. Jay tagged along. Along the way they came across the remnant of the site where the tinker was attacked. The body and cart were long gone but the blood, debris, and tracks still remained. New Josh and Jay attempted to follow the tracks but go lost and wound up near Kensla, shrugging their shoulders they went into the village where they met the rest of the party. There old Josh, a human thug, was working with the Village Reeve Tomas on how to defend the villager while the harvest was going on. The next day the harvest began. It was quiet for most of the day until it got near sundown when the wolves launched a mass attack on the party. The fighting was a huge mess and while everybody fought valiantly several members were injured grievously. Towards the end old Josh fell unconscious but luckily the fight was almost won at that point so Josh survived. Both the fight and being first aided. The party straggled in the village and healed what they could. Elder Anselm, a priest of Mitra, also applied some healing spells. They faced the next day with dread but there were no wolf attacks. The 2nd night, Big Jerry cleric decided to mediate and commune with her god Silvanus. Silvanus sent Big Jerry's cleric a vision of what happened. A young women wearing Thothian Robes was performing a demonic ritual at the site where they found the wolf den. The ritual apparently failed only later in the vision, after the women left, the cleric saw a wisp of smoke appear and enter the den underneath the rock. The players then decided to head off to the Golden House a conclave of Thothian Mages several miles to the northeast of the village of Kensla. They spent another day guarding the village. During which they saw several wolves watching them from a distance. Neither side attacked. The next day they got Yoluf the trapper and had him guide them to the Golden House. Along the way they saw more wolves watching and old Josh Thug decided to attack it. However the wolf was bait for an ambush. The Thug got away and a timely sleep spells by the Dwarven Rune-caster felled five wolves. Big Jerry's Cleric casted Speak with Animals. They found out that they considered the demon wolf the Master and there were several wolves that acted as lieutenants. One of the wolves was very defiant and the Cleric made an example of him causing the remaining four to consider the Cleric as their pack leaders. The players did a good job roleplaying this and wound up with four wolves to augment their numbers. They went to the Golden House where they met the resident Thothian masters. Some were cooperative and other were hostile. Especially after it was revealed that the source of their information was a vision by the Cleric. However their Baronial Writ and the Satchel they found in the last session kept the conversation going. During all thisone the mages excused himself. Saying that he had some lab experiment he had to tend too. Unknown to the party he recognized the satchel and the description being one of his apprentices. He went to search his quarters and see what happened. Jay's Dwarven Rune-caster happened to look out a window and saw the female apprentice from the cleric's vision riding away on a horse. After this the remaining mages became cooperative and went off to find the one that left. They found him in his room frantically searching. It turned out he kept a book on demon summoning that he found during his journeymen years. It was useful to his party in gaining a treasure in the dungeon and he swears that he never actually summoned or dealt with demons. From the description of Big Jerry's Cleric it appeared that the culprit was his apprentice Arbella. The party borrowed some horses from the Golden House and pursued the wayward apprenticed. When they crested the ridge they saw that she was in the midst of another ritual and there were many wolves surrounding her. They debated their plan of attack for some time until the ritual reached some important point a circle of fire briefly erupted. Apparently something wasn't finished as it continued but it was enough to spur the party into action. They thundered down the ridge in their horses and charged the leaders of the pack. In a single pass by the party they slaughter both wolf lieutenants causing many of the wolves to flee. Unfortunately Big Jerry's cleric rolled a 1 while shooting her Heavy Crossbow. The high powered weapon not only broke but the recoil caused the elven cleric to fall to the ground prone. The four wolves under the cleric's command ran through and engaged the wolves as the party wheeled around and charged again. This time focusing on Arbella. She went down quickly and was catapulted off the summoning rock and laid still at the base of the 5 foot cliff that it was on top of off. Then the Demon Wolf appeared and attacked Little Jerry's halfling. Some of the remaining wolves engaged members of the party leaving only the new Josh's Elven Burglar and old Josh's Thug to help the halfling in the fight. After several charges the demon wolf fell. After cleaning up the remaining wolves the party rejoiced but then they saw the spirit of the demon rise from the wolf and possess the body of Arbella. A disqusting tentacled creature burst from her split skin and immediately went after the Dwarven Rune-caster who was nearest. However the party reacted immediately and the reborn demon fell under the onslaught. With the demon finally dead the party returned to the Golden House to return the horse and explain what happened. Deeply embarrassed the Golden House bribed the party's silence by giving some choice magic items. Then the party returned to the village and there was much rejoicing over the death of the demon wolf. However the party realized the Yoluf witnessed the going on at the Golden House. To get his silence they had to pay a hefty price of 1,000 silver pennies. Yoluf country bumpkin act turned out to overlay a pretty astute mind. Then the party returned to the Baron of Westtower where they each received the promised reward of 5 gold crowns. They retired to the local tavern to plot their next adventure. Big Jerry Cleric of Silvanus was critical for moving the adventure to it's conclusion. His timely meditation request gave me the opening to feed the party critical information on their enemy. I need to look at my cleric and see if there are little tweaks to make them more flavorful and more in-tune with their deities believe. The idea of meditating with Silvanus who has dreams as part of his aspects fits the god well. Jay's Dwarven Rune-caster was a bit of challenge as he was the first player to pick on the ritual based magic users. With those classes the resource management is not in your spell book or spells per day but how much silver (or gold) you are willing to invest into your spell casting. I need to be careful with the cost so that it reflect the relative power of those types of magic-users. Jay seemed to like the class and it didn't seem overpowering. new Josh Elven Burglar is an interesting combination. What would drive one of the glorious race into petty thievery? They are immortal, enjoy nearly perfect health, really don't want for anything in their homelands. Boredom perhaps? It will interesting to explore this in future sessions. little Jerry's Halfling was quiet and sometime seems to be dominated by the older gamers. But the halfling was a bastion for the party proved crucial in the majority of the fights. Without him I doubt the party would have survived. 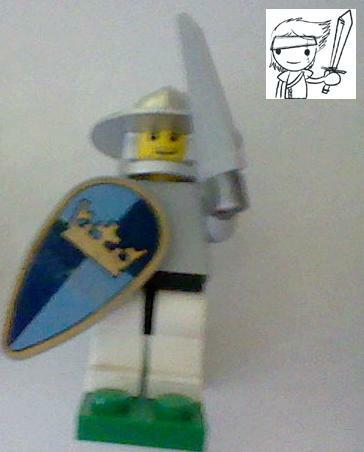 A little annoyed at his small stature as he couldn't use a broadsword except two handed. However one of his reward was a broadsword of lightness which allows him to wield it one-handed. Plus he crafted 12 arrow heads out of the bones the demon wolf. May prove useful one day. old Josh's Thug was interesting classwise and character wise. While not as good as little Jerry's halfling fighter he was definitely one of the party's main fighters. His abilities came useful whenever the party had to deal with other people whether it was sweet talking, lying, negotiations, or just outright intimidation. I liked watching how he played the character and felt it really achieve my objective of having classes that were good at thing other than fighting or spell casting. This session also helped me with the design of the adventure as I was struggling to figure how to reward the party other than a grateful Baron gives them X. The deal with the mage's buying the party silence will be woven into the adventure and be one of the best ways for the party get get material (or rather magical) rewards. So now I got to come up with a new adventure for the J-Squad in June. Looking forward to seeing how they deal with that. Sometimes you should think real hard before allowing a magical effect in your game. This is the thirteenth in a series detailing the 34 steps I recommended for making a Fantasy Sandbox Campaign. Today's post will cover part of the following step. to collect the various Royal fees and duties. 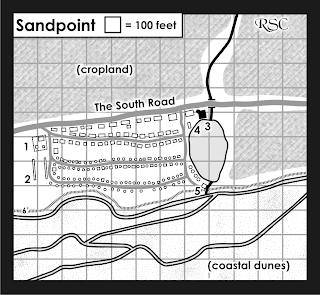 Sandpoint is located on a low bluff overlooking the coastal dunes of the regions. From here it is about a 1/2 mile to the high tide mark on the beach. The bluff is only 6' high however it is steadily eroding. This has caused the wealthiest halflings to live near the king's road and the poorest nearest the bluff. The wide spaces between the rows of houses are used as pastures and gardens. Many make a small sum of money renting their pasture during the annual sheep shearing. Hightower Estate, the ancestral home of the HighTowers of Sandpoint. Several extended families living under one roof make this place a madhouse. The Sandpoint Sheepfold. Every April the annual sheep shearing held here, thousands of sheeps are moved between the two stands and their fleece shorn off. Afterward the wool is washed and stored in dry cellars underneath the stands. In May the Great Island Sheep Fair is held with buyers from all over the Midland Sea coming to bid. The King's House, this is the currently the residence of Albrus Oldham, the Reeve of Sandpoint. The Oldhams are currently much in favor among the poor of Sandpoint for shoring up the bluff three years ago. The Mill Pond Inn, This inn is run by Janson Poundfoot. It is a warren of rooms both for the big folks and the little folks. Many patrons have gotten lost among it's three stories. For most of the year the inn is mostly empty with most of his business coming during the spring Sheep Fair. Sandpoint Mill, Gladys Yellowbottom runs the inn with a iron fist. Much of her family lies in terror of her legendary temper. Only her nephew, Manny Yellowbottom is not intimidated and livens up the day with his practical jokes. Note: To the east the river flows south from Mount Devon through the South Downs forming a steep ravine through the bluff. After emerging from the bluff it turn west to flow past Sandpoint. From the bluff to the sea it forms a braided flood plain with the channels changing every year. It enters the Midland Sea about a mile to the southwest of Sandpoint. Sometimes it is hard to come up with a village layout. In this case I turn to historical maps and other gaming products particularly Harn for inspiration. There are several websites one can use as a resource. One I like particularly is The Aedificium a living history for England. 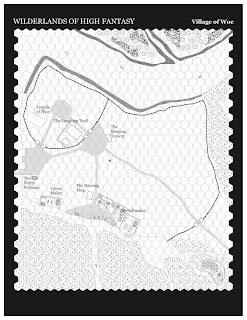 Of particular interest is this map page which has several maps done in the Harn style which makes them very useful for gaming. The one that inspired Sandpoint was Serlby. One interesting thing to do is look at the Nottingham map and at some of the village map. You realize that some of these places are literally a stone throw away from each. Not particularly useful for gaming as fantasy campaigns work better with a bit more wilderness between settlements. However it is interesting to see how the medieval landscape was laid out. Finally a map making tip. Many probably wonder how I did the cropland. Many vector and paint programs have the ability to use textures. These are bitmap or bitmap patterns that you can use to fill shapes with. This particular one was done using Corel Draw using a cloth canvas pattern rotated 45 degrees. I created two full 8.5 by 11 bitmaps in TIFF format at 300 dpi that you can use. One is grayscale and the other is full color CMYK. The full color use yellow and brown to give an impression of crop soil along with the texture. You can download it here. That it for part XIII next is Part XIV. I apologize for the long hiatus on the Fantasy Sandbox series. 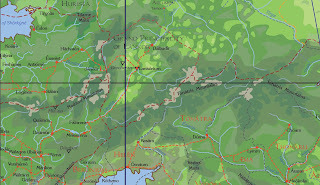 The main issue was the next steps involve a lot of map drawing. My map time for the past several months was taken up by other projects. To speed things along I am breaking Step 24 where I draw maps for several locale into more managable chunks. 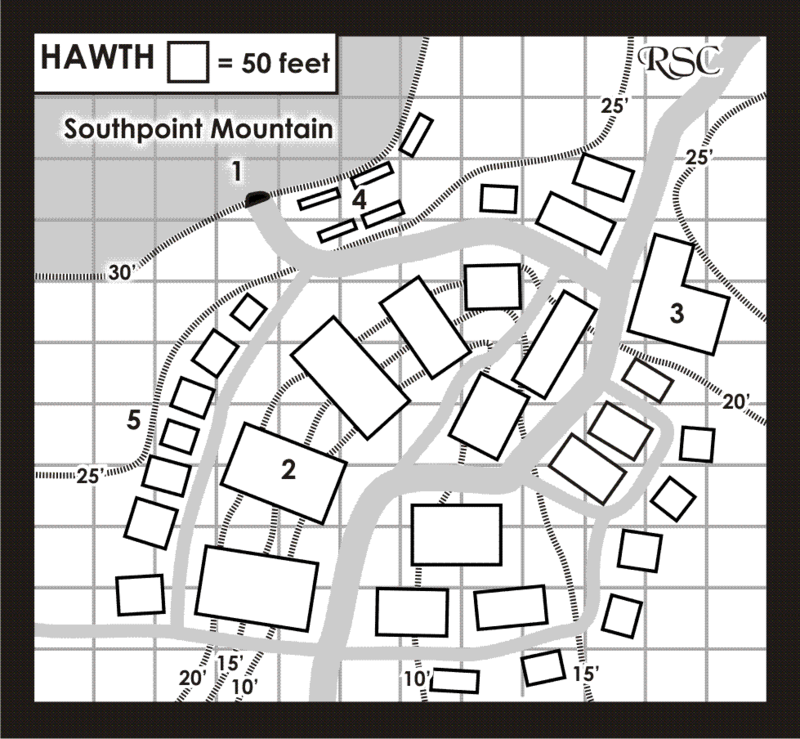 Today is about the village of Hawth. This is the twelth in a series detailing the 34 steps I recommended for making a Fantasy Sandbox Campaign. Today's post will cover part of the following step. Located just outside of the Southpoint mine this is home to 200 dwarves. Their homes are carved out of the rocky walls of the canyon leading to the minehead. 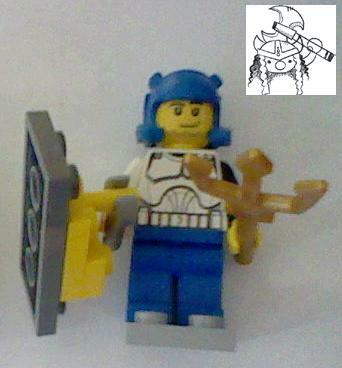 Lord Dair Darkiron (Ftr5, L) directs the mining operations. Original motherlodes are beginning to play out. Lord Dair opened a new section of mine that promises renewed riches but a rash of disappearances has caused it to be closed up. 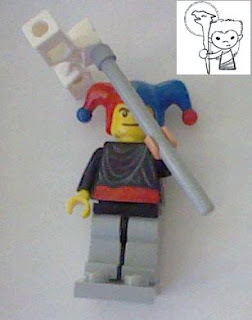 Lord Dair’s brother, Gamli is challenging Dair’s leadership of the clan. Lord Dair will pay handsomely to anybody who can find out what has happened in mine. The Mine Head currently guarded by a half dozen huscarls of Lord Dair. Lord Dair's Clan Home. His brother Gamli lives in the hall to the north. The Rusty Battleaxe, local inn and tavern run by Kenar of the Rusty Battleaxe clan. Kenar is noted for organizing charity relief for the miners that have been struck hard by the troubles within Southpoint Mountain. The Ironmaster Camp, the best ore taken where where the Ironmasters use ancient magics to forges the best dwarven weapons and armors. Upside, where most of the miners live. Currently the site of much discontent against Lord Dair's rule. Gamli has several agents among the miners to keep tensions high. 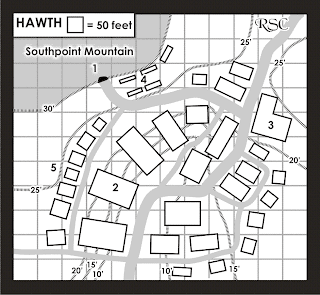 Note: Most of the houses in Hawth are made of stone and built into the terrain. Typically they are three levels with the highest above ground, the second level partially covered by the slope and the third completely underground. The maps is draw in a quick style with a few notes. By adopting this style you can quickly generate material for five or six of the most important locales outside of the character's home base. If one of these locales become more important you have a base from which to flesh out the final details. As for the design of the village I was inspired by several villages in Greece and Turkey that had to adapt to the rocky terrain of the region. Often built against steep slopes much of the building lies inside the hill or mountain. Edwin is alive! and more Sword & Wizardry goodness. Last night's session (Monday) of Swords & Wizardry was a lot of fun. It started off with the character studying new spells and training. I allow a 1,000d (sp) to be spent for one week of training for 1,000 xp. Syvrivald and Eoleander took advantage of this to train while Ashling studied for two 3rd level spells. During this Syrivald helped Fluff the Flappy of the Grog Stop by investing some money to help do some repairs and prepare for the upcoming festival week. In addition he found out that not only Fluff was a cleric of Dannu he was a high level cleric of Dannu. Capable of raising poor Edwin despite being dead for 9 days. Fluff agreed to the casting the spell after a donation of 3 gold crowns (320d each) to the church of Dannu. Edwin awoke marveled at being alive. But the stench of decay cling to his clothes so he went off to take a bath and get into a fresh set as soon as he could. When he learned of the expedition to Clendower he asked if he could stay and watch the house instead. Then they equipped themselves for the expedition to the Trehaen Circle of Clendower. (the C is not a misspelling). Unfortunately it is in the middle of the territory controlled by the Tarngol Emperor, a faction in the Viridian Civil War that is hostile to the Elves (Eoleander and Ashling). To overcome this they went to the Council of Viridistan and requested a couple of Tarngol uniforms and fake passes. The Council of Viridistan, once being adventurers themselves, takes a liberal attitude towards adventurer types in Viridistan. They are tough but they are willing to work with various groups and their madcap schemes provided there is some benefit. In this case a full share of the treasure found. With a provision that if they find a library that it will waived be if they get a copy. So they hired an old friend Illthan Porvus, Captain of the Green Maiden to give them passage to Yalusa on the frontier between Gormmah and Tarngol. It lies on the coast between the Barradine Mountains and the Trident Gulf. Along the way they were attacked by Tarngol privateers but easily defeated them with sleep spells and hold person. Landing at Yalusa they were questioned by the Gormmah Guards and antagonized them. As a consequence they were taken to the balisca and forced to register their travel plans. Unfortunately this involved getting numbered tally sticks good for the road from Yalusa to Gormmah. They wonder what will happen when they don't use them as they plan to strike north through the Barradine Mountains. They spent a pleasant day and evening at the White Gold Inn when they left Yalusa. During the climb into the mountain they encountered demon cultists led by Darken Levander a full blood Viridians. Once again sleep spells came handy downing everybody but Darken. Given chase they ran down the Viridian and webbed him. Eoleander revealed that he was half-Viridian and despised the full bloods. After a short consideration he killed Darken Levander. The rest of the party slaughtered the cultists. Unlike a previous expedition the crossing of the Barradine mountains was uneventful. After another day's travel they reached settled territory under the control of the Tarngol Emperor. They donned their uniforms and headed north to where Clendower is. They almost stumbled into Grita Heath the location of the unit their fake passes said they were from. But they turned north and after another day's hike reached the mountain pass that leads to Clendower. There in the pass they discovered a strange crater and a cave on the slopes underneath. In the cave they fought dwarves of the Darkhaven clan. Now they prepare to venture deeper into the cave. Just a reminder that the awesome Darth & Droids is just starting Epsiode III. This is a comic that re imagines Star Wars as if it was a roleplaying campaign. If you read the first two movies you will understand why so much of the prequels seemed so ... well ... odd. I just saw the Whole Wide World after it being recommended by James at Grognardia. I can't say exactly what about it is appealing to gamers like myself but I find it very enjoyable. Both Vincent D'Onofrio and Renée Zellweger do an excellent job. Also it is true that the movie is gorgeous with many excellent shots of the Texas landscape. My friend, Tim of Gothridge Manor, is reading Spartacus War. After seeing Spartacus, Blood and Sand, he wanted to read up on the man. He recommended it to me. I looked up and found it was available for the Kindle and bought it. So far it is a good read. One pleasant surprise was about the Sura plotline from the TV show. Sura, Spartacus' wife is a priestess, in Spartacus mind she is not only the focus of his love but also the focus of a prophecy that he is touched by the god and destined to do great things. I thought it was artistic license by the producers but it turns out that something similar was reported among the ancient writers. The author of Spartacus War admits that it was presented more as rumor than verified fact but given the time period very well could have played a major part in Spartacus motivations. Which leads to my Majestic Wilderlands campaign. From time to the time, the gods of the Wilderlands will speak in visions, signs and portents. For each player I will make up a vague destiny that relates to the unfolding events of the campaign. Occasionally I will send a sign or if the circumstances warrant it a vision. For those who play clerics, paladins, and myrmidons the communications can be more direct. The important thing about this that players can act on them or not. Free will is a very important part of the Wilderlands cosmology. The gods send them to show what they could be, not what they should do. What they do about is entirely up to them. While I like a well designed adventure module the ones I prize are those that can be easily adapted to the circumstances of my campaign. Many times when I need a bandit stronghold I goto the Secret of the Slaver Stockade and alter a few things to fit the situation. Some common situations have not had little if any support from adventure modules. What would you like to see covered? For example an orc infested forest, bandit stronghold, wizard tower, etc. While the module would be a standalone adventure it would offer replay value in that you can reuse it another campaign or locale. I plan to incorporate some of these ideas into the upcoming Scourge of the Demon Wolf. Along with the adventure you get a crossroads hamlet, a typical village, a conclave of magic users, a beggar encampment, and possibly the bandit cave as well. The full details are written up in appendixes after the adventure proper. For the future I would like to know what type of locales you would find useful. The usual method of advancement in GURPS is the award of several points at the end of a session. Usually between 2 to 4. It is somewhat bland and depending on the campaign it unrealistically causes a character to zoom up in points in relation to came time. This stands in contrast to the realistic nature of many GURPS rules. Runequest in contrast does things more naturally. When a character succeeds on using a skill they put a tic mark next to it. When they can spend a week of rest time they can make a roll to see if they learned from their experience. If they exceed their current skill level (higher skills makes this less likely) then they earn +5% to their skills. High intelligence can modify this roll favorably. In addition to learning through experience, a character can pay to learn new skills and train existing one. However training only works to bring up a skill to 75% after which they can only uses experience to learn higher skill levels. This system has a lot of flavor, and feels more realistic. Plus it directly relates to game time. GURPS has a section starting at page 290 of the Character Core Book about Improvement through study. Basically it takes 200 hours of learning to earn one character point. You can learn on the job at a rate of 4 hours of job work = 1 hour of learning. You can try to teach yourself if it makes sense. This works out to 2 hours of self-teaching to 1 hour of learning. You can goto a school. This works out to a 1 hour of school = 1 hour of learning. A full college courseload for a semester of 21 weeks will earn 5 points in 5 different skills. You can pay for intensive instruction in which you get 2 hours of learning for every one hour of intensive instruction. The cost for these options depends on the campaign setting. For a TL 3 fantasy setting I would say teaching is a comfortable job so hiring an instructor for intensive training would set you back about $6,000 per month. In the Majestic Wilderland that would be about 1,500d (sp) or 3 gold crowns. But at 8 hours a day for 28 days you get about 448 hours worth of learning or 2 character points. 1 point every two weeks. As for learning through experience. I thing the following addition would work out nicely. When you succeed on using a skill you put a tick mark next to the skill. When you have a week to rest and reflect on your experiences you roll 3d6. If you roll a 3 or 4 you don't learn anything. If you roll under your skill you learn 1d2 points in that skill. If you roll equal to or over your skill you learn 1d3 points in that skill. If you critically succeed by rolling a 17 or 18 then you learn 1d6 points in that skill. If your skill is 17 or higher then a 17 always succeeds but you only get 1d3 skill points. An 18 still always gets you 1d6 skill points. This is not per session. If you adventure, rest a week, adventure again and rest again in the same session you get to roll to twice for any skills you succeed in. While adventuring characters can spend at least 2 hours on self taught learning in addition to whatever they are getting. The effect of this is that it ties the awarding of experience more heavily to the passage of game time. Existing skills will tend to improve faster especially in situations where characters have to use many of them. Over on Gothridge Manor I made a comment that I thought the 12 miles per hex that Kingmaker use is a too large for mapping a sandbox setting. Roger emailed me to ask me some more detail. So I am turning the answer into a post. You could limit this but you don't want to make the region so small that the player are able to move past it's bounds in a session or two. Nor you want to make the locale spaced so far apart that and the howling wilderness of the 30 mile hex effect. Expanded beyond that to the size of a Judges Guild Wilderlands detailing that many locales becomes a bit of chore. Good random tables help as an idea generator. As for Kingmaker what they did was put something in just about every hex. However they choose to only detail a 6 hex column by 5 hex row region creating 24 locales of varying detail. James of Grognardia has a series of posts on miniatures and various RPGs. One of which is about Traveller. In it he talks about the personal combat system and the starship combat system. This brought to mine that like original D&D, Classic Traveller has an alternate combat system. Like D&D's combat system it became the default in MegaTraveller. The system is spread out in two supplements, Azhanti High Lightning and Striker. A third, Snapshot, modifies the range band system of the original books into a combat system that uses grid. It focuses on combat within a starship. There is a fourth, Mayday, that adapts starship combat to a hex and counter system. Classic Traveller originally used a base 8+ chance to hit on 2d6. This is modified by your weapon and the armor the target is wearing. You add up the modifiers and that your base chance to hit. This system was continued in Book 4 Mercenary. Judges Guild made things easier by coming up with a referee screen for Traveller that added all the modifiers up. You crossindexed the weapon with the armor type and then pick which of the five ranges you were using. (Two for melee weapons). A similar chart is found in Snapshot. In Snapshot the actions within a round (15 seconds) is regulated by the expenditure of action points. You get a sum of action points equal to the sum of your dexterity and endurance. The Azhanti High Lightning/Striker system is somewhat different. It also has an action point system but it works slightly different than the Snapshot system. One major difference is that the original 15 second round has been divided into 5 action phases of roughly 3 seconds each. The to hit roll is still 8+ and it is modified by range and situation. Instead of damage there is now a penetration roll of 2d6. Higher is better. Each weapons has a penetration modifier which varies by range. Each armor type subtracts off of the penetration roll. You look up the result on the damage chart to see whether you get no damage, a light wounds, a serious wound, or die. Striker expands on this to the full range of military hardware and includes the ability to design your own vehicles and other military hardware. The handful of times I ran Traveller I waffled between using the original system and the Azhanti High Lightning system. Most of the time, because of the Judges Guild Referee screen, I used the original system. Not sure what I would do now if I ran Traveller today. The intro to an original space campaign that I never ran. It would have used GURPS Space for the rules. Mankind has reached the stars only to find Earth. Birds flying through distant skies, fish swimming unknown seas, and dinosaurs ruling unexplored continents. On a hundred worlds are found the children of the Earth; an Earth of sixty-five million years ago. Man has outgrown his cradle and now wonders who and what scattered the seeds of the Earth throughout the stars. He are forging a new life among the stars but old fears and conflicts still threaten. The year is 2403 and this is their story. Basically the premise was that inhabitable planets were discovered around nearby stars and by the 21st century several slower than light colony ships were sent out to colonize. They could reach up to 1/10th light speed. Earth suffered a collapse (the exact nature I never settled) and the colonies were cut off. A hundred years later FTL travel discovered (a warp drive) and the colonies and the new nations of Earth expanded throughout near space. It was going be like GDW's 2300 AD with a bunch of national colonies and outposts. Many were served by the United Colonial Guards. Imagine the US Coast Guard being run by a UN style organization and worked with any nation willing to contribute to it's budget. The "aliens" I designed were the Barron Consulate who were humans who members of a losing faction during Earth's recovery. They had a psionic society. Unlike Traveller's Zhodani their society was dystopian. There were the Saurians who were sentient dinosaurs more technologically advanced than humans. First contact was made with fringe colonies of the Saurians which not like mainstream Saurian society. Note these are NOT the dinosaurs that left earth 65 million years ago. Rather a group that evolved intelligence on another world. There were the N'Dassa which was a virus that joined any creature with a higher order nervous system into a hive mind. It exists because so much of the local space was terraformed by the dinorsaurids 65 million years ago. So there a lot of planets with compatible biosphere. Currently it limited to fringe colonies and easily controlled by standard disease control protocols. Doesn't make it less scary and it has been found on multiple worlds that direction of human space. The big mystery is who were the ancient dinosaurs that left earth 65 million years ago and terraformed everything for hundreds of light years in every direction. On most worlds 65 millions years have obliterated any artifacts due to geological actions and weathering. Even on airless worlds enough time has passed that much of their stuff has sublimated into nothing. However there are a few sites here and there. The genesis of this setting came when I was reading SPI's Universe and noticed there was a 100 year gap between effective slower than light interstellar travel and FTL travel. So I used the near star map it came with and wrote up a history of the sub-light colonization of near space. Looks like a bunch of folks from Australia have put together a nicely done magazine catering to the OSR and fans of older editions. It is called Encounter Magazine and the first issue can be downloaded for free. I recently read that Dr. Holmes, the author of the D&D Blue Book edition has recently passed away. It was is his edition of D&D that got me started on this whole mess :D.
I can still remember rolling up a magic user and heading underneath Porttown, taking a right and running into some skeletons. I let loose my lone magic missile which didn't down a single one. I was left trying to hit them with my staff. After I got hit once I was down to a single hit point. Using the parry rule I starting parrying successfully fending off the skeleton's attack for a while. However if I moved away or dropped the parry they would get a free attack on me. Stymied I just sat there until one of them got a lucky shot and dropped me. Thanks Dr. Holmes and god bless you. Sometimes movies and the fantasy genre seems like a wasteland. For every standout there several duds. The same for mages, sorcerers, and wizards. These are my five favorites. 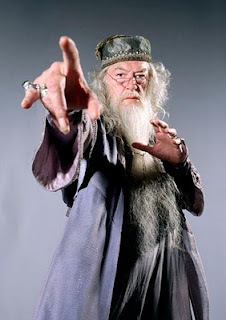 As headmaster of Hogwarts, He molded several generations of Wizards including the most famous Harry Potter. J.K. Rowlings writes a convincing character that is brought to life by Richard Harris followed by Michael Gambon. Ailing Ulrich tricks his apprentice into transporting him to Urland for the final showdown with the dragon Vermithrax Pejorative. Craggenmoor is only exceeded by Hogwarts as a cool place for a wizard to live. The newest entry in the bunch. Legend of the Seeker may be a series that just OK but the actors really give it there all and Bruce Spencer as Zed tops them all. Unlike the other four wizards Zeddicus comes off more human. He definitely got the "I know the secrets, you don't" vibe but he also knows when to take a break and just be a person. 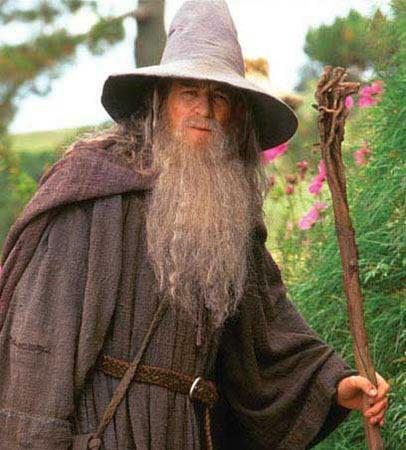 Ian McKellan does a standout job as Tolkien's Gandalf the Grey. Buoyed by excellent directing, a good script,and a standout cast for many he THE wizard. 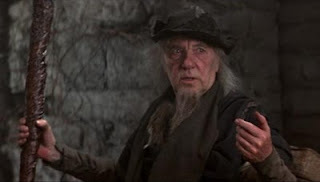 Despite Ian McKellan acting and the quality of the film version of the Lord of the Rings, the best wizard of all time for me is Williamson's Merlin. 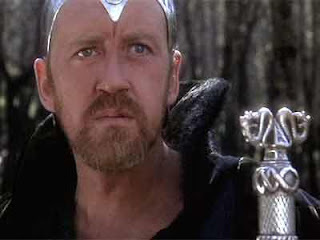 Excalibur is a great film and the cast is as well. But is it is Williamson's Merlin that steals the show. Probably helped that Nicol Williamson and Helen Mirren disliked each other. Do you dare look into the eyes of the Dragon?! James at Grognardia has a post on what genres/subjects that the OSR should focus on as well. I played GURPS and Hero System for a number of years. Those RPGs are universal system with a number of genre books implementing the core system for a specific genre or setting. Based on my experience here is a rough list that should help the discussion along. The last two, Humor and Adaptions, are often mixed in with the others. For that matter many RPGs are a mix of two or more genres. For example ShadowRun. Hopefully this list will help people think about what other areas that old school games can cover. Tim of Gothridge Manor brings up some good points on the Sleep spell. What I do in my S&W Majestic Wilderlands campaign is have the caster roll 4d4 for the hit dice effected with a max of 4HD . Allies of the caster are not affected. This results in up to a possible 4 4HD creature being affected. Which is a little more generous then by the book but I find it much easier to use in handling groups with varying HD. In such groups I count off the lower HD first. Part of the problem Tim talk about is amplified by the fact that so much of my campaign takes places in cities and locales with a lots of people. Unlike a dungeon where the use of sleep becomes less and less the deeper you go the sleep spell remains a potent weapon in the Majestic Wilderlands throughout the character's career. Tim's post raises some interesting points which our group will need to think about. This is one of my house rules from when I ran 1E back in the 80s. In this post I give some thoughts on Runequest (namely the 2nd edition) and some thoughts on my ideal RPG. Here on Knight-n-Knaves I expand on those thoughts during a discussion about the OSR. At one point I make the comment that there is no reason why Runequest can't work with a d20 roll high system. For example if Rurik (our favorite RQ sample character) has a Shortsword skill of 55 then on a d20 roll high system he would have a +11 bonus to a d20 roll. If he rolls 20 or higher he succeeds. If you look at much of Runequest much of the bonuses and calculation are divisible by 5. This just makes it easier to convert over to a d20. The reason for this exercise is to try to roll back Runequest more to it's D&D roots. Runequest originally started out as the Perrin Conventions a set of house rules for D&D popular on the west coast of the US. The transformation to Runequest came about because the players were SCA players (medieval reenactors) and found the abstract combats system unsatisfying for visualizing their fights. The work was combined with Greg Stafford's Glorantha setting and the result was Runequest. By taking Runequest back to it's D&D roots it is my hope that a system can be built that can easily use the wealth of material published for older editions of D&D. Such a RPG would not feel the same as playing a game of D&D. It purpose is appeal to those that wants more realistic combat, and being able to customize their characters through the mechanics of the game. Yet still take advantage of perfectly good D&D material. By converting a Runequest character over and use a d20 roll high system it become obvious how a D&D monster COULD be used directly. To take Rurik +11 with a shortword we see that we can simply say that to hit a S&W Red Dragon with a 17 ascending AC he will need to roll a 6 or better with on a d20. Now the numbers are little out of whack here. A D&D fighter that is as experienced as Rurik probably would have a reduced chance here. If we say that 5th level is equal to a starting Runequest (this is a number off of the top of my head) then the D&D fighter has only a +2 to hit and needs a 15 or better to hit that S&W Dragon. We could fix this and say that in combat involving Runequest characters add 10 to the AAC giving the Red Dragon a 27 AAC. Now Rurik needs a 16 or better to hit the dragon. Runequest damage is roughly compared to D&D damage so we can just apply the result to the Dragon's hit point. I have to put in some thought on how the Dragon would hit Rurik which I will do in a later post. The end result is that I think it is possible to design a RPG that has more realistic combat, more character customization options yet be able to use the bulk of older edition material. I will keep you posted on my thoughts on this. I got a few more projects, (yes I know Tim shut up) to get out of the way before I start worrying about designing my own RPG. In memorandum of Edwin aka "Shanghai" beloved henchman kidnapped off of the streets of Yalusa, transported to Viridistan, Stood side by his compatriots in two fights against the Python Street Gang. Bravely entered the mysterious elven forest of Elsenwood. Alas in the depths of the ancient Circle of Pelys he fell after handling a spell trapped book. The mage Syrivald valiantly tried to use his knowledge of the healing arts to save him. He only made the problem worse and Edwin died. This week Kelestia Productions released Venârivè: Northwestern Lýthia. This supplement covers the northwestern region of the continent of Lythia which Harn is part of. This area is roughly the size of europe and contains a similar range of cultures. Like Harn vs England the various cultures of Venârivè only faintly echo their earthly counterparts. Some, like the matriarchal Empire of Byria have no Earth equivalent. So what do you get for your $35? First is is a PDF only product for now. It comes with three PDFs, The 250 page Venârivè supplement itself, an extensive index, and a map pdf. Plus it comes with a excel spreadsheet that has just about every table in the PDF including a lot more data for the various locales. 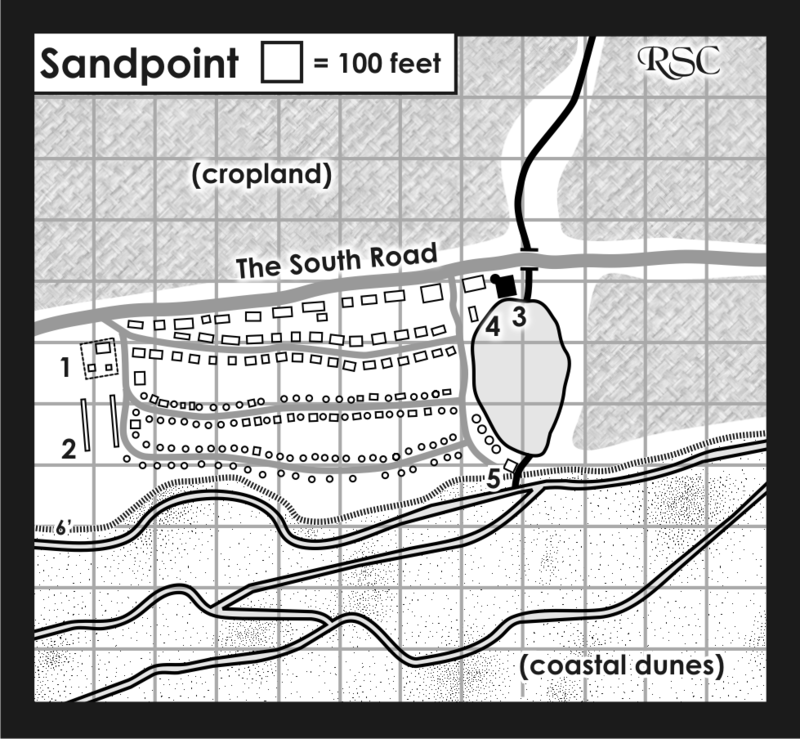 The Map PDF is absolutely gorgeous, it is saved in a vector format so you have near infinite zoom capability. It has dozens of layers allowing you to tweak the maps to show exactly what you want. It may be a bit slow on some system as the vector format takes a bit of time to draw. But the result is a very nicely rendered map. There is enough detail for the dedicated harn fan to use as a base for their own detailed maps. They have layers for historical boundaries, trade roughs, climate, rainfall. Just about everybody a person could want to know about a campaign setting. Venârivè itself is 250 pages. First you get a two page broad overview of the region. Next is are 11 pages devoted to the history of Venârivè. Then a 4 page timelime summarizing the history. Six pages on the Cultures and Languages of Venârivè. The following sections are of general use to any low fantasy campaign ground in realism. Next seven pages are on the Societies and Government of Venârivè including types not covered in any Harn product before this like Imperial states. Five pages on Law (always useful for dealing with those pesky PCs). Four pages on Military and Warfare including naval warfare. Six pages on Economics and Trade including Nomadic and Pastoralist economies. Two pages on the Mangai, the association of guilds. Probably the least realistic aspect of Harn/Venârivè setup. Seventeen pages on Daily Life in Venârivè. This section is packed with interesting little tidbits that can be used as seeds for adventures. The next sections are Venârivè specific. Two pages on Folklore and Legends. Useful for roleplaying the inhabitants as they don't have the God's eye view the referee has. Six pages on religion. Like my own Majestic Wilderlands Venârivè is setup with only a few deities that are known by different names in different lands. How they are worshiped varies as well but there is a core that most worshipers of that deities recognize. Seven pages on the Arcane side of Venârivè mostly on the Guild of Arcane Lord and the Shek Pvar. Finally the meat of the product, a 63 page gazetteer of all the realms of Venârivè from Harn in the west to Dalkesh in the east. 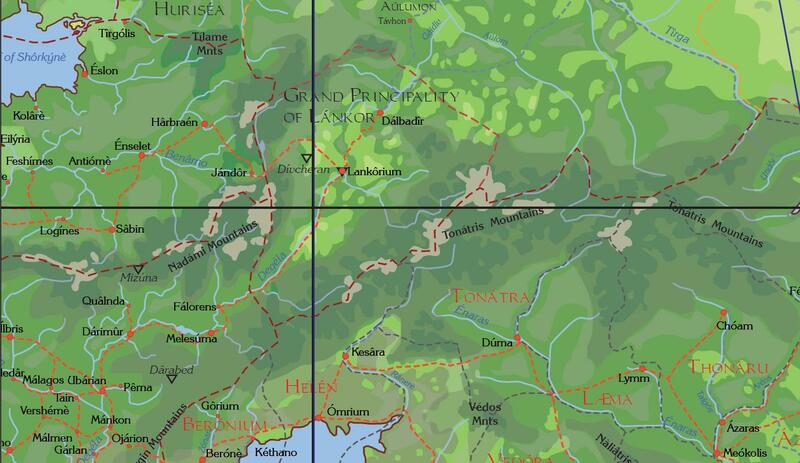 From Ivinia in the North to Anzeloria in the south. Some are only a handful of paragraphs, while the more important or interesting realms get two to three pages. Long time fans of Harn will not be disappointed in this material. The main part of the supplement winds up with nine pages about various famous individuals in Venârivè. What I like about this section is not your usual king's list but contains artists, writers, and philosophers. A skilled referee can use the information here to make some interesting back stories to his adventures. For example a wealthy patron could send the players into an old imperial Àzeryáni ruins to find a valuable statue carved by Akélnos el Vêgasun. Another wants them to find a lost recipe of Enârla el Tothánko a famed chef to the Àzeryáni Emperors two hundred years ago. But the supplement doesn't end there. It comes with 19 appendices. Lìa-Kaváir (Thieves Guild), various arcane chantries, titles, colleges of heraldry, religous organizations, languages & scripts, and the Chéler Kántehusen (I think is equivalent to the historical Hansatic League of merchants). Karéjian Larún (really big merchant convoy sailing every year), Triezi duchies, Àzeryáni Provinces, Regnal List (ah the king's list got to love them ;) ). A comprehensive price list that expands on the one in Harn and Harnmaster. Note that for older editions of D&D one Harnic silver penny is roughly equivalent to a D&D silver piece. Incomes for various occupations in Harn (you will see why there is a reason why the players are adventuring). Various Venârivè trade goods, A listing of all the ports and markets in Venârivè. Very similar to Traveller subsector listings. Then we get Tide tables, the old Harn weather charts get an expansion to cover all the climates from the subpolar north to the wet tropical south. Harn weather charts are perhaps the best I seen for roleplaying games. They are easy to use and generally don't give nonsense results. Finally the appendices ends with a map of Venârivè and index of locations including the all important ancient locations. Both Kelestia Productions and Columbia Games are notorious for their slow release schedule for Harn products. But they are finally done and released they are often masterfully done. Venârivè is no exception. For a long time I preferred the traditional style of Columbia Games over the color style of the various Kelestia releases. But Venârivè may change my mind. It is well laid out and feels very much like you got your money's worth in both content and presentation. For those who are not Harn fans Venârivè offers a one stop location for all things medieval and campaign realism. The lands are varied and many have unique histories that can be minded for your own campaign setting. Maybe using tide tables is pushing it for me but I can see it being important for those ports where you can only get out twice a day. While it doesn't offer a complete rule subsystem aka Traveller for merchant activities all the raw data is here. Using Venârivè as an example you could roll your own traveller style merchant system but for your fantasy campaign. I give this a A+ all across the board. Wizards just released a free kids version of D&D called Monsters Slayers Heroes of Hesiod. So today my youngest found the box of dice that I was given from Morningstar Games in Savannah GA. He wanted it and I said "sure you can have it as long as you take care of it". So he goes away for a 1/2 hour and comes back and wants to play a game with me. I said find as long as I get to play a game of my own with him. (He can be stubborn about trying anything new). He games was fun, he used all my D&D props and setup this coliseum where each of our guys (lego figures) had to run around gathering energy barrels. How far we move is determined by a d20 roll. After a few rounds of this we switched to Monster Slayers. Monster Slayers is a pretty simple game. Hit Points, Ascending AC, Move X squares, d20+bonus to hit, everybody has a special power or two that written on the cards. The adventure is simple as well. You completed your monster fighting training which every kid in Hesiod is required to do. Now for your final exam you have to fight four monster. A Bulette, A young red dragon, a beholder, and a swarm of pixie. Generally when a monster get to half hit points or there is only one the instructor will release another one. 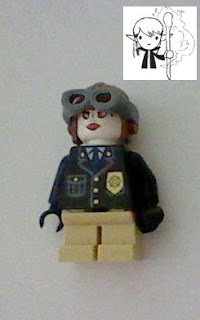 Of course Gregory made Lego figures for this. It was a whole of fun, plus my boy can roll! He rolled a total of six nat 20s in the fight once two in a row! The rule and special effects are easy to referee. The result four monsters dead and everybody was alive. He wants to play some more so I will work up another scenario for him. Probably use the Ruin of Ramat as finding a little dog seems to be a win with the younger kids.